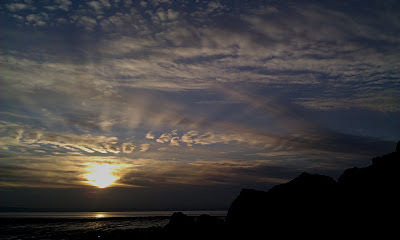 2012 is now officially up and running, with a cracking start at Brean Down. We headed off on Saturday morning, expecting it to be sunny but bitterly cold, so we were well wrapped up for the weather. Arriving at high tide, we had to walk over the top to the crag. Never having had to go that way before, myself and Ramon got slightly lost, so after a little impromptu warm-up on a deep water solo traverse, we arrived at the foot of the crag sweating heavily under our down jackets. Nic and Pino had come down separately in Nic's car, as they had to get back to London quite early, and were already on the warmup routes - and looking rather pleased with themselves in the sheltered little suntrap that is Boulder Cove. 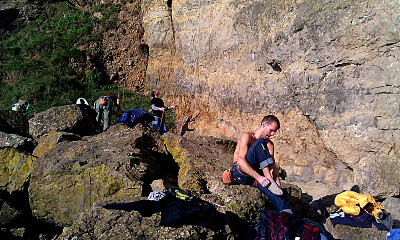 I whipped my shirt off to dry out, and as the steam rose from my damp torso, I quickly realised it was going to be hot enough to climb like this... shirt-off climbing in the UK in January, who'd have thought it! 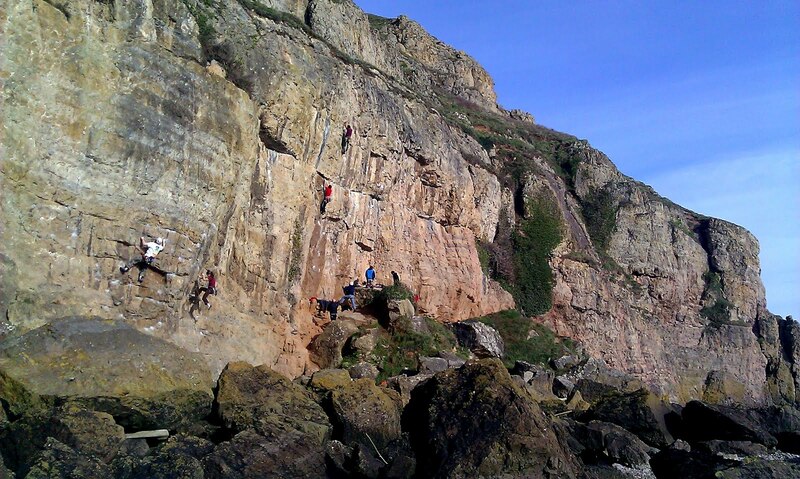 By the time we'd warmed up, the crag was getting pretty full (some had come via Cheddar, which turned out to be too wet for climbing) and free lines were in short supply, so we got onto Clashing Socks - a 7b which Ramon had sent last year, but I hadn't been on before. It was a typical Brean line - some balancy climbing to a good rest, and then a bouldery crux where footwork was crucial. With Ramon's help, I managed to figure out a sequence on my first go, but I hadn't paid enough attention to my feet so fell off the crux on my next two attempts. Fourth go however, I deliberately went a little slower through the crux and it went, feeling relatively easy in the end. At first I was a little annoyed that I hadn't ticked it a bit quicker, but I guess it's to be expected that my footwork will be a little sloppy, after a winter in the gym. So when I stopped to think about it, I've got to be pretty pleased with sending a 7b in one visit, after not touching real rock for four months! Ramon cruised up Clashing Socks a couple of times, making it look easy despite his winter hanging around on axes, and Nic was looking pretty good working on Chulilla (7b+), so a strong start to the year all round. But more importantly than that, I think for all of us it was a real feel good day in the sunshine, loaded with the promise of good trips to come in 2012. Time to get cranking for 2012!